2016 was the warmest year on record according to data released by the United States’ National Oceanic and Atmospheric Administration. 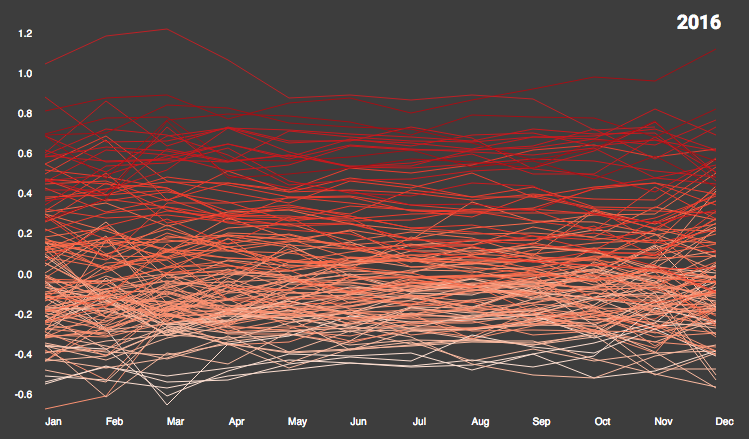 The data compares the average global temperature for each year, from 1880 to 2016, with the average global temperature for the whole of the 20th century (represented as 0 on the vertical axis in the visualisation below). For example: the January 2016 average temperature was just over 1 degree celcius warmer than the average January temperature for the whole of the 20th century. Each line in the chart below represents a year and it’s clear that the monthly average temperatures in the 2000s are higher than the global average for the 1900s. This visualisation was inspired by the work of Peter Aldhous who plotted the same data using R. My version was done using D3.js and adds a couple of additional elements (decade selector, hovers) but the original idea is very clearly Peter’s. The data is from the National Oceanic and Atmospheric Administration and I originally found Peter’s plots via the excellent Data is Plural newsletter. There is another version of this here which does a (slightly) better job of being responsive to multiple screen sizes.